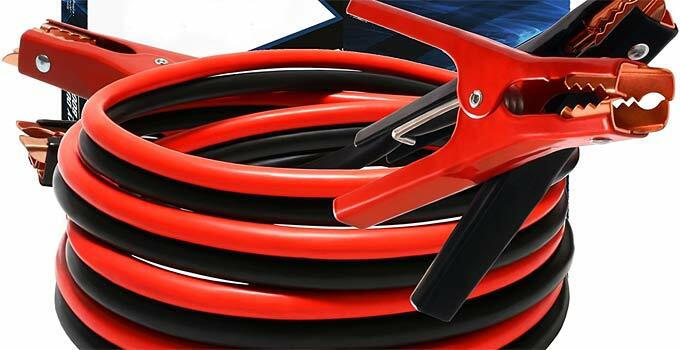 Here’s a little advice for the best size jumper cable size to keep in your car or truck. You do have jumper cables in your vehicle, right? Did you know that cold temperatures will greatly reduce your car’s battery capacity? And that’s one reason why it’s a good idea to keep jumper cables for just in case. Another is being a good Samaritan. As a car battery ages, it will become even more susceptible to poor starting during cold weather. In fact, a car battery can freeze solid in cold weather if it becomes too weak! If a car battery has a full charge, it will not freeze unless temperatures get to 76 below zero. Unless you’re living on Mars, your car should start in cold weather if the battery is in good condition and fully charged. On the other hand if a battery is fully discharged (dead as a door nail), it will freeze solid at 32 degrees F! As you can see, a partially charged weakened battery will be susceptible at cold temperatures. – The smaller the wire diameter the less power it can handle. – The larger the wire diameter the more power it can handle. When starting a car engine it is amazing how much power gets sucked from the battery. In other words, a typical car starter requires a lot of DC Current (Amps) to start the engine. How much current flow? How many Amps to start a car? It varies depending on the engine. Generally, a typical car requires about 300 – 500 Amps from the battery while starting. Diesel engines require more because they have a very high compression ratio. A diesel truck engine may require as much as 1,000 Amps during start up. Note: The colder it is, more Amps are pulled from the battery. Cold temperatures reduce the electrical charge voltage in a battery and increases the amount of current (Amps) needed to start a vehicle. Note: Car batteries are rated with Cold Cranking Amps (CCA). It is a rating for the amount of Amps a battery can discharge in 30 seconds at 0 degrees Fahrenheit while maintaining full charge voltage. The higher the CCA the ‘beefier’ the battery. Now that we know how many Amps may flow through jumper cables, we can consider the wire gauge size. It’s all about gauge. Jumper cable gauge refers to the thickness of the cable’s wiring. Note: When looking at wire gauge numbers, the higher the gauge (numerically) the thinner the wire. The lower the gauge number the thicker the wire. The best jumper cables will be those which are able to flow the most energy from one battery to another. Thicker jumper cables (lower gauge) can transfer more power than thin jumper cables. For most cars I recommend 4 gauge jumper cables. For heavy duty trucks, especially diesel I recommend 1 gauge jumper cables. I posted this because yesterday I had to jump a vehicle, and I was glad that I had heavy duty jumper cables in my truck! Good info to read, thank you. Surely it is all common sense to most of you. But, for myself, I have never actually had to myself use these. It all makes sense (heavier is better), but, still something I had never given a thought to. Other uses. It would probably ruin them but I can see using them as a tow cable. Numerous strands inside could be used for such things as lashing, snares, trip wires. Probably wouldn’t make a very good fishing line though. Not recommended, but I once used my jumper cables to whack a snake, cables were the only thing handy as the moment. Fortunately not a poisonous snake (which we don’t have here), just a big one and I hate snakes. I think I levitated a couple of feet when I saw it. The cable clamp worked pretty well like a bolo, took a couple of shots to get it right. What you need to know. Red to positive on both batteries and black to negative on both batteries. Better to do it yourself to prevent mistakes. Connect the back first. Then connect the red to the dead battery and hold onto the other end of the red. Before you clamp it tap it on the positive battery post to make sure it isn’t drawing big amps (before actually trying to start). Then attach and start. If there are two of you stand by the hot battery ready to disconnect while the other person cranks the engine. If this is done wrong you can blow up the good battery, start a fire, weld metal to metal or create enough sparks and or heat to harm yourself. Sometimes the reason your battery is dead is because you killed it trying to start the car. Don’t kill the good battery too. Don’t run the starter for more than ten seconds. Wait twenty seconds or so after that ten seconds before you try again. If your engine is flooded use the appropriate starting technique or you are wasting your time. If you don’t have any idea why your car won’t start you may be wasting your time. If this has occurred before on this car then you have a problem, get it fixed because excessive starting procedures will cause more problems. Trying to save $70 by not buying a new battery could cost you $400 or more for a new starter and that could be just the beginning. In general do not take the air cleaner off and try to start it with the air cleaner off. If you choose to do this than get your kids and valuables out of the car first because it can catch fire. Again; make sure you connect it properly and this means do it yourself don’t let your buddy or a helpful bystander do it. Be very careful when connecting up jumper leads to modern cars. All modern cars are full of computers. Some cars have a reverse polarity connector protection device which “MAY” protect your ECU’s in case of wrong polarity connection. Similarly. Do not jump start other vehicles with your battery in your car. Any possible spike coming backwards from a dead battery or suspect circuit in another car could severely damage your own car ECU’s. Many cars require codes to be reset a dealership or independent service centre in the event of changing out batteries. Some cars throw a code when the batteryu gets low and this code needs to be reset by a scanner or someone with dealership equipment. Some cars require their facilities to be reset after a discharged battery or changing batteries – e.g. Radio presets, automatic windows or sunroofs or auto seats or auto mirror presets etc etc. Some manufactures discourage the use of those jump start quick devices Ken has mentioned. Check in your car’s user manual or ask at the dealership. Always use a stand alone known good charged battery to jump start a car. That was educational. I learned a lot. Old saying, when you quit learning you start dying. I make my own from 00 wielding cable and flash wield copper ends then use a heavy duty clamp. That way I can use them for about anything from thawing pipes to wielding lead extension. In the way back machine I was a mechanic, we did road service. The first cold weather blast and the phone never stopped ringing, 12 hour days, sold a ton of new batteries. I watched people use very thin wire, cheap jumper cables and just crank on the ignition; the cable insulation would get very hot and occasionally I have seen wisps of smoke from them. Does make them very flexible; think overcooked spaghetti noodles.. I have thick wired cables in addition to jumper packs in all three vehicles. My `09 truck battery (original, so no complaint there) gave up the first cold day in December last year, jumper pack to the rescue, drove to the local auto parts swapped in a new battery. – Mine are 1 ga,, 25 feet. There are also 4 ga. sets in both cars. I can also use them for recharging my solar system batteries when the sun is not cooperating, and I can use any vehicle battery to start my big generator (8750 W) rather than trying to keep a battery in it for starting up. Makes life simpler around Smurf village! Also, look on u-tube and you can learn how to weld with 2 or three batteries and 2 or three sets of jumper cables! If you can weld already, this makes a good back-up for being broken down in the middle of nowhere. Personally I have had an array of “jumper Cables” all through my life and mostly was disappointed in the ‘Clamps’ look at both of Kens Links and you’ll see the differences. Find cables with the heavy ends for sure, even if a lighter wire-size. One word of Caution, learn how to use Jumper Cables correctly, there is an inherent danger of used wrong. Especially if used on the “liquid/Acid” filled batteries, Mainly Hydrogen Gas. And if connected in ‘reverse’ you can literally explode a Battery and/or totally burn the wiring and Alternator out of a vehicle, NOT good. good ideas for other uses, although I understand the stated limitations…(Grey). Thinking it over, and seeing as how there are strong clamps on each end…—how about to temporarily closing off a path or such? Those clamps should latch on quite well.. I have the 4 gauge in the cars; in my truck I carry a Clore 660 Jump Start. The Cables have not been used, but the Jump Start has been used frequently….and not on my vehicle but cars/trucks of people who were dead in parking lots, Rest Areas and a Boat Ramp. I heard or read where the 660 could raise a dead horse….well it has worked on everything I tried, but no horses to date!! A neighbor has several cheap sets of cables because they want to be prepared. One day the inefficiency of a set made them ask me if I could drive way over to bring mine – so I said why don’t you just clamp two sets together. The person asked, what would double the length do for us??? I had to say put a red clamp on a red clamp and a black clamp on a black clamp at the other end so you would have double the carrying capacity – it worked to their amazement. There is nothing like good equipment and tools but first you must engage the brain. That was an extremely good suggestion. Some advice when purchasing booster cables. Ken’s correct, size matters, but pay close attention to the quality of the clamps. Many manufacturers save money by putting cheap, copper coated jaws on the clamps. These need to be solid copper/brass. Pay attention to how the cable is attached to the clamps. Are they soldered terminals bolted on or a simple roll crimp? Booster cables are like chains, they’re only as good as their weakest link. A tip if you are forced to use cheap booster cables. Attach the cables (red to positive, black to negative) correctly. If the vehicle needing boosting engine is still hesitant to turn over, leave the cables attached, raise the rpm’s of the boosting vehicle and let it transfer charge to the dead battery. It may take as much as 5 minutes to transfer enough charge through the marginal cables for the car to start, but this usually will work. It just requires a little patience. If the wires are only soldered to the terminals I can see problems. Hundreds of amps of power flow through the jumper cables the wires, clamps and the connection between the 2 of them. It would be quite easy for the power flowing there to generate many times the heat needed to milt the solder. You always want a crimped connection of the wire to the clamp. Soldering the connection is OK if done to help the physical connection, but it should not be a stand-alone method. Chuck, again you’ve left out part of what I posted in order to challenge what I said. I didn’t speak of the wire “only being soldered to the clamp”, rather the stranded wires being soldered into a terminal, usually brass, that is also crimped around the wire, that is then bolted to the the clamps. Why solder? Because solder permeates around each strand of wire, insuring connectivity to the terminal and thus, full usage of the available current carrying ability. Why is this important? It reduces the resistance to the current flow and thus the heat build up that you fear will melt the whole rig. I was describing the cables bought or fabricated by people that depend on them frequently, not the cheap off the shelf booster cables with the simple crimp connection found in the cute little plastic pouches at Wally World. I posted more to point out that solder melts easily and can be a fail point. I think we both are on the same page with this. Sorry if it sounded like I was disagreeing with you. No problem Chuck, I may have not been as clear in my description as needed. I recently added another vehicle and have been putting together everything for roadside emergencies and general preparedness so that I don’t have to transfer everything from one vehicle to another every time I use the new one. I have been thinking about purchasing a portable jump starter instead of cables for this vehicle. Lots of the starters also have USB ports, LED emergency light, and other cool features. I am really looking at the Black and Decker PPRH5B which also has a compressor for a flat tire. Does anyone have any real experience with these kinds of units? Jumper cables are a must have when you are away from the homestead. I bought a couple good pairs that have plug in connection in the middle. That way you can check to make sure both cable ends are hooked up correctly before you put juice to the weak battery. Both ends have a red light come on when they are correct and the plug in connection plugs in only one way. That way you don’t have your battery fried by ignorance. I also have a jumper box as well. They can be used to retrieve information from someone who is reluctant to give it. Also need a couple rags and some water. Now this can be used for a good reason or a bad reason. Ya, a good clamp on a sensitive body part can be an encouragement. 🙂 Even without the power boost. When it comes to my kids and especially my grandkids nothing is “off the table” when it comes to protection during WROL. I got them either at Tractor Supply or NAPA parts. Thank you will start my search at those places. I have three power packs; each is a 400A peak portable with phone/laptop ports. One I purchased in August, 2015 which I leave in the vehicle summer and winter. I bring it in the house to check the charge and always it’s in the 80-90 percent, no issues. Just my opinion, but if you purchase a jump starter I would also carry jumper cables in the vehicle. But, I’ve always been paranoid about equipment failing just when I need it. The above post was for Mico, I goofed on the reply, sorry. Sometimes when you don’t have the right equipment you have to make do with what you have, think outside the box, more than one way to skin a squirrel, etc. Years ago, my wife and I took a short trip to the southeast corner of Oklahoma to drive the Talimena Scenic Byway. We pulled into a fairly secluded campground/park and found a young mother with 3 children who were stranded with a dead battery on their car. Seems they had stopped there to eat a picnic lunch and had left the lights on, killing the battery. She had no booster cables and neither did I, but I did have a toolkit in our car. I removed the batteries from both car’s, attached my battery to her’s, started her car, then swapped the batteries back. She thanked us profusely and I advised her to drive for at least an hour before stopping her engine. Problem solved. And yes, my wife remained in our car with a pistol in her lap, watching the perimeter, in case it was a setup. Had to chuckle about the “thinking outside the box”. Anyone here ever use the two top strands of a Highway Barbwire fence for Jumper Cables, OR tow cable? Watched my Dad do that jumper cable/ barb wire thing many, many years ago when I was just a young sprout. I have also seen a car parked where the only jumper cables available were too short, due to it being surrounded by other people’s vehicles and being uphill to push it out. We took and jammed one metal bumper to the other metal bumper, then connected one end of the jumper cables we had to the dead car’s red terminal, then the other cable, then to the live car’s battery. Let it idle for a few minutes, then try it. Started right up. Along that same line, I have also seen a car started without cables by jamming metal bumper to metal bumper, then jumping the red post to the red post with a tire tool. It worked, so I guess that’s good enough. Bumper to bumper with these new cars would be problem.LOL! Plastic to plastic bumpers might take awhile. Maybe they can download an app to their phone that will save the day! Sure glad my truck is a 5 speed. When all else fails give it a push. Dennis, Brilliant! Thanks for sharing the tip. I made mine from old welding cables years ago. The clamps can be removed for cleaning and wire maintenance. I also keep battery post brush with them. I have seen post which look clean yet form a film preventing proper charging. Periodic connector and post cleaning is a must. Be sure to check the battery cables for corrosion and necessary cleaning. I didn’t realize that there were different jumper cables. Now I’ll have to go and see what we have in the car. Still learning new things at my age. Of course at my age, I probably already knew that, but forgot it. I saw a guy use a really small jumper box. It was about 6″×12″×2″ thick. It started the car easily. Must be néw battery technology . Has anyone seen it or own one of these? I was skeptical about it but it worked great. Have to agree on the Plastic bumpers. When I commented on it to a millennial, I was told, “That’s what AAA is for!” SMH. Do you notice that when you do something like help with a car or fix something on the fly that the younger people are in awe? It’s like we are magicians or something. Abracadabra your car is jump started! BIG, mine are roughly 8 x 4/5 x 1 inch (l x w x h), slick little thihgs. Came with a box and adapter cables for phone computer charging. My engines are smaller (4 chi. and V6s), not boat anchor engines like Mr. TP has. Not BIG but Bill Jenkins Horse, ah well. I wonder how long that box would keep a phone or radio charged up. The wife got me one of those health watches. Counts how far I walk each day and how many calories I burn. I’m averaging over 5 and a half miles a day j just around the homestead and stores. Who knew? About 40 miles a week. I have walked almost every area leading up to the homestead out to 150 miles. A couple areas will or could be dangerous. I would have to travel at night or early morning. That’s why I carry night vision for those areas. Hold up during the day. Pass at night. About a year ago I bought this battery thing that is supposed to jump start a dead car. I got it for three dollars at The Good Will. It holds a charge and has a USB output. It didn’t have the wires to jump a car and I don’t intend on buying them. I haven’t opened it up as it works. But I would make a guess that it’s full of NiMH rechargeable AA batts. What I use it for is a USB power source. I don’t know how many amps it puts out, but it charges my tablet comp, my phone and Nook E-Reader 3-times as fast as the wall chargers so it has to have a good flow of amps to it’s USB port as my tablet charger says it puts out 2-amps and it puts that to shame as far as charge time. I only only needed to charge it once in the last 6-months despite using it twice a week as a USB charger. As a prepper this thing makes a lot of sense for keeping all the USB toys we all have topped off. I also have numerous solar panels to charge this jump box thing. The nice thing about charging a battery like this with solar panels is that it stores the suns light (it’s power) for later use at night. I am going to put a cable / wire on it to power my Yeasu FT-817 UHF / VHF / HF all-mode radio. It should work well for this as the 817 is a QRP (low-power) radio that doesn’t use a lot of power. Chuck,thanks for letting us know that it works. I’m concerned that if any in our group had to walk here that radios, phones power would run out. Communication along the way would boost chances to make it here. Of course it depends if the electronic gizmos work. Last year before the wife retired I installed a Faraday box in our vehicles to store our radios. I’m thinking that one of these slim chargers should be in each vehicle. As far as getting the deal I got it’s not that uncommon. I find interesting things all the time as I always stop at garage sales and thrift stores as I drive from one job to another. This jumper thing weighs very little and is 2/3 the size of a paper back book. It would be great for a go-bag. I wonder if that might be something to throw in the BOB or GHB at the last minute. B J H (spaces worked, lazy typer), great idea, not much weight add. Nummy that I am, got mine online. Could comparison shop. It could be the new tech they were hocking on the 24 hour “must have channels” during the holidays. Saw the same one in our Costco during Christmas, since there is no track record on the durability or longevity left it setting on the shelf. The one I saw in action worked well. The guy said he has jumped big pickups with it. If I remember he said it was around $80. Might have to grab one and check it out. I’ll throw another tid-bit into the discussion of jumper cables. Stranded wire conducts electricity better than solid wire (like Romex) of the same gauge. The more strands of wire, the more efficient. Why? The majority of the electricity flows over the surface of the wire, not through the interior itself. Why do professionals prefer cables made from welding leads? The strands in welding leads are almost hair-like thin, in some cases having 10x-20x more strands than standard battery cables of the same gauge. This makes them much more efficient and much more flexible (they rarely kink). Alst the stranded wire is much more flexible to use where you need to move the wires around like a jumper cable set does. Another thing is that stranded wires are more resistant to breaking when use in auto & truck wiring. Solid core (ROMEX) can break when exposed to vibration and flexing over the years. ROMEX is less expensive and still RV companies (motor homes, trailer manufactures) still use stranded wire. They make RV’s as cheep as they can, but still buy better wire. This is about batteries, rather than cables. Ken mentioned that dead batteries will freeze at 32 degrees. A dead battery frozen solid will usually crack and is history at that point. If you can’t charge up that dead battery before it freezes, remove it from the vehicle and take into a warm place where it can’t freeze. Now that would be common sense. But some times when you’re dealing with a problem it’s easy to forget simple stuff. Then later you tell yourself I know better. That pesky “fog of war” syndrome. Don’t have them in my truck so when someone wants a jump no cables. Was told by fleet manager when I pick this Dodge Ram up do not jump anything with this rig. It has two 1000 amp batteries and from what the manual says you can damage both vehicles by jumping. Could unhook one battery but as the other is live that could be dangerous. For now I’ll have to take Dodge word on it and pass on jumping from this truck. Southernman, I would never tell you to do something you believe could damage your new vehicle. Having said that, my DuraMax had a similar battery set up and electronics as your Dodge and came with the same warning. There’s no telling how many times I boosted others w/o damage to anyone’s vehicle. My daughter’s new Chevy Cruze with a charging system maybe 1/4 that of the diesel came with the same warning about boosting others or receiving a boost. Have a friend who is a Mr. Good Wrench factory trained GM mechanic who says it’s just an attempt to discourage idiots who would cross polarization when hooking up booster cables. A lowest common denominator warning if you will. Think about it for a moment. If a sudden surge of voltage/amperage will fry your electronics, how the heck do you install a new, fully charged set of batteries w/o causing damage? Amperage won’t as a device (your auto’s electrical system) won’t take more amps then it needs. An example of this is your auto’s light bulbs, A light bulb only uses 1/4 of an app, but a car battery has over 500 amps in it. Why doesn’t the bulb blow up when 500 amps is applied to it, Answer, it only uses what it needs.And a surge of voltage usually means voltage in excess of what the intended device normally runs on. Your auto runs on 12-volts, the battery you connect to it is 12-volts. 12-volts being supplied to an auto that runs on 12-volts is not a surge so no over-voltage problem. There is no way for an auto battery to somehow jump in voltage to a dangerous voltage. In truth 12-volt batteries when fully charge sit at 12.5 volts and the autos alternator puts out 13.8 to 14.4 volts, so the auto is actually a bit higher then the battery. The reason for the auto putting out more voltage is that you can’t charge a battery by putting into it the exact same voltage it has in it. You need to get above it’s float point (12.5-volts for the typical auto battery) to get it to take a charge. Chuck, I was writing my continuation below while you were posting this. You’re correct. I would point out though, you left out the “if” that began the passage you quoted from my post. I was pointing out the same thing you are saying, not that I thought it would fry the electronics, but in fact it would not. Your Dodge, assuming it’s a 12 not 24 volt setup, like most diesel pickups, has two 1000 amp batteries as you said. These batteries are connected in conjunction, not in series, much the same as when you connect two separate batteries with booster cables. It would make no difference to the electronics if you connected two or twenty 1000 amp 12 volt batteries in conjunction. They would only put out 12 volts power and make available 20,000 amps. Amps are not bullies, they don’t force themselves on the electronics. The electronics only use what they need and ignore what’s there available in reserve. Your pickup needs the extra amperage capacity for the starter to turn over that high compression diesel engine, while that micro amp 12 volt LED instrument panel light only draws what it needs even though on the same circuit. You probably already know this, but some folks may not. I have a similar set up. Two monster batteries in my Super Duty. No issues whatsoever giving someone else a jump. Its simply more batteries in parallel which presents no problems. In fact its even better because there’s more available capacity to turn over the engine. I made a set of jumper cables they are 20-feet long and are 300 Amp welding wire. They are 30-years old and over the years have always worked when giving someone a jump. No need to leave them connected to let the dead battery as they allow for a lot of amps to transfer through the cables. Not that I go out of my way to give random people a jump much any more. I don’t see much gratitude for helping them and have backed off on it. Heavy jumper cables can definitely be a plus. However don’t underestimate jump boxes. 90% of the time I am by myself. I keep a jump box in my side by side, my 4 wheel drive camoflauge ” Urban Insult ” vehicle and my regular truck. I was on the back end of our property last year and accidently bumped the switch on for the fog lights on the side by side and ran the battery down. If I wouldn’t have had the jump box. I would have had to walk 15 acres to get another vehicle to jump with. Then I would have had 2 vehicles to get back home by myself. Or I could have tried to call someone and try to convince them to bring their ” normal ” vehicle through the creek and the woods to gimme a jump. ( not likely! ) I was able to finish what I was doing, jump the s x s and still make it home by beer thirty! I have a jump box and mostly use it to air up tires and to power things when camping. You are right if you are out in the wild by yourself (or even in the city) a jump box allows you to dig yourself out of a problem where a set of jumper cables require another auto. Really we should have both. But in truth I normally don’t have the jump box with me most times. I’m a ham radio guy and always have radios with me and can get other Hams to help. But then I guess most of us could say the same thing about using the cell phone to summon help. There is a procedure to jump a battery with cables from another vehicle battery that is to be followed to prevent exploding the battery. What is it? Simple, connect the positive to each battery and the grounds to the engine or body that is some distance from the battery so there is no sparks right next to the battery. This way if there is any off-gassing of hydrogen (can you say Hindenburg) you won’t get an explosion. Also. Not all car batteries are under the hood. My wife’s HHR battery is in the rear, under the plastic cover crammed in with the spare tire. There are jump start lugs under the hood. But some folks might not know about this. Another thing I have done for years is to clean the battery post and clamp on the inside and outside so it’s all nice and clean. Put the cable back on and tighten it up. Then spray both post with Polyurethane so heavy that it’s dripping off the cable and post. The more Polyurethane you spray the better this works because the Polyurethane stops air from getting to the lead post. This will greatly reduce the corrosion forming on the battery post. It will work for years. I have found that many times an auto refuses to start, acting just like a dead battery. The problem was a poor connection between the battery post and the cable. A few warnings about playing with auto batteries. They have a LOT of power in amprage. If you lay a wrench between them the amperage will melt the wrench, it can easily cause an explosion of acid that can scar your face and even blind you. Even touching the battery can get acid on your hands and clothes. You should have old clothes, goggles and wash your hands when done even if you don’t think you have any acid on them. If your hands start to itch you have acid on them and need to stop to wash it off. All of us interact with auto batteries in that we use them to run our autos so it’s easy to be complacent. But there is a pot of power in them and some very dangerous chemical that being acid. Being complacent can bite you hard, so either learn about the danger and or find someone that does understand the danger if you need to do things with auto batteries. My friend replaced all the parts between the spark plugs and the battery until finally discovering it was corroded terminal connections. Made good friends at the auto store at least. Chuck, what about using dielectric lube? Old Chevy never used dielectric lube on a battery, not sure how it would work? I always thought dielectric lube was made for connection of wires like in a plug like between a socket and a light bulb. But really I never used it much so my use and understanding of it is somewhat limited. I do woodworking a lot and always had / have spray Polyurethane on hand so I use it. I have had all the concerns listed in these posts about boosting. My solution was to pick up a spare battery ($100) which I use to start my generator and also take with me if someone asks for a boost. This way my own vehicle is not at risk and I can get at the problem vehicle battery no matter how it is parked. Every month or so, I trickle charge this battery and it has lasted several years. One thing I forgot to mention is to keep a bottle of water mixed with baking soda handy in case battery acid should get into your eyes or on your clothes or skin. A quick flush with the water baking soda mix will neutralize the acid instantly. We always keep a jug handy in our shop. Is it okay to leave the trickle charger on a deep cycle battery long term? Old Chevy, yes and no. The old style trickle chargers put out a continual 1/2amp charge even after the battery becomes fully charged. This eventually will damage the battery. Newer trickle charger/battery-maintainer only charges when the battery drops below full charge automatically. This does not harm the battery. Just make sure your trickle charger includes the word “maintainer” in it’s description.